The 2015 North American FlyBoard Championship will be held, June 4-6, on the Red River in downtown Shreveport-Bossier, Louisiana. During the three-day event, more than 70 of the world’s best FlyBoarders will compete for $30,000 in cash prizes. This will be the second FlyBoard Championship held in North America and the first ever held in the United States. 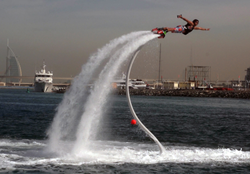 Previous FlyBoard Championships have been held in Toronto, Dubai and Qatar. The event is free for spectators to attend. Spectator viewing areas will be located along the riverfront at the Louisiana Boardwalk Outlets in Bossier City. For more information, visit http://www.nafbc.com or http://www.arklatexflyboard.com. The weekend of the 2015 North American FlyBoard Championships will be filled with intense competition on the water, as well as special guest appearances and demonstrations. FlyBoarding will be taking place at the following times: 9 a.m.-7 p.m., Thursday, June 4; 9 a.m.-8 p.m., Friday, June 5; and 9 a.m.-6 p.m., Saturday, June 6. FlyBoard inventor Franky Zapata will present a HoverBoard demonstration at 4:30 p.m. on Saturday, June 6. An LED-lit nighttime FlyBoarding demonstration will be presented on Saturday night following the trophy presentation at 7:30 p.m.
"This event has the potential to have the highest attendance of any event in the history of FlyBoarding," said Rich McGahan, co-owner of ArkLaTex FlyBoard. "With a $30,000 prize purse, it will have the biggest payout ever, and this area has never seen a nighttime FlyBoarding show like the one that will be put on display Saturday night." Sponsors of the 2015 North American FlyBoard Championships include ArkLaTex FlyBoard, Aquafly, Shreveport-Bossier Sports Commission, Campers RV Power Sports, The FlyBoard Store, FlyBoard Mexico, FlyBoard Quebec, Aquatic Aviation, Skyhigh FlyBoards, FlyBoardCanada.com and Alberta FlyBoard.com. Additional local Sponsors are currently being sought. For more information, contact Rich McGahan of ArkLaTex FlyBoard at (318) 751-5287 or rich(at)arklatexflyboard(dot)com. Open since 2014, ArkLaTex FlyBoard is a FlyBoarding service located at Melvin’s Landing on Cross Lake in Shreveport, Louisiana. For more information, visit http://www.arklatexflyboard.com or call 844-TRY-2FLY. For more information on things to see and do in Shreveport-Bossier, visit http://www.shreveport-bossier.org.